The stories of Kings’s Cliffe people who served in WW1. Published by Kings’s Cliffe Heritage with support from Heritage Lottery Fund, Margaret Giffen Community Fund, East Northamptonshire Council and Northamptonshire Council. I have defined “King’s Cliffe Men” as anybody who was born or lived in the village before the end of 1919 and who also served in the forces during WW1. I have kept the definition of “forces” as wide as possible so that it would include nurses, members of the YMCA etc. My researches have been limited to what is available on the web, together with information brought to me by family members and villagers. Had I taken the research further it is doubtful if the book would ever have been completed. It follows therefore that, almost without exception, there is more to say about every person in the book. Regimental war diaries, for instance, whilst not naming individuals, will reveal what particular battalions were doing day by day. The stories are particularly short of what happened to people after the war. We would encourage all families to seek further. To this end the web version of the book will be continuously updated. Names that are underlined and in italics, are of those people known to have died in, or as a result of, the Great War. The spelling of names in historical records can be very variable, if not to say idiosyncratic. We have, where possible, used the modern understanding of how a name was intended to be spelt. This can cause problems when searching databases for individuals. In the narrative the current street names have been quoted, but where we quote extracts from historical documents they will frequently use the old names. Refer to the 1911 street map on page 03 to locate the old street names. Reverend Bryan, referred to frequently in the stories, was the rector of King’s Cliffe between 1955 and 1985. He had a keen interest in local history and signficant searches through the local papers for information on King’s Cliffe. Illustrations are generally from King’s Cliffe Heritage archives. A few illustrations are from the web and I have attempted to obtain permission for their use where possible. If there is an inadvertent omission then we would appreciate that the owner should contact us via our website so that this can be corrected on the web version and any future print run. 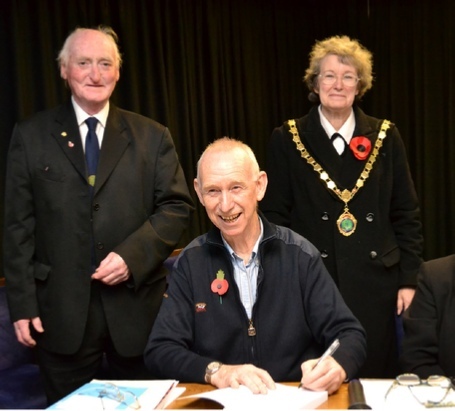 Mike Herring (centre), Researcher and author at the book signing event 11th November 2014. This book could not have been produced without signifcant help from members of King’s Cliffe Heritage. Sue Trow Smith who spent hours sorting photographs and adding to the stories from her local knowledge. Jim Wilson for proof reading Richard Trow Smith for proof reading the final draft. Tina Carey for turning my prose into something readable. Mark Wiseman ARPS for creating the front and rear cover. All the families who have so enthusiastically added to the stories and provided family photographs. And finally to my wife Jane, for not actually divorcing me and citing the computer as the other party! We acknowledge the financial help we have received from The Heritage Lottery Fund, Northamptonshire County Council, East Northamptonshire Council, and Northamptonshire Community Foundation via the Margaret Giffen Community Fund.